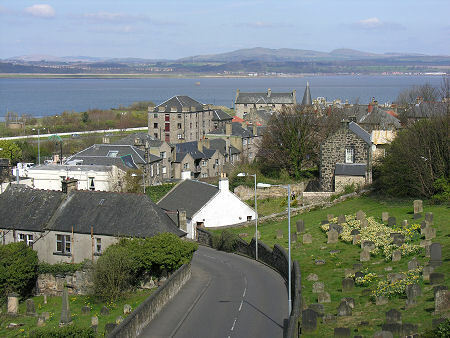 Bo'ness lies on the south bank of the River Forth and just over two miles north of the historically important Burgh of Linlithgow. And this ancient link helps explain Bo'ness's unusual name. 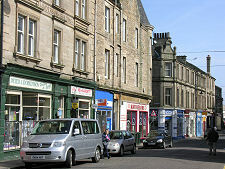 Although Bo'ness is the form of the name used on road signs and maps, it is actually a short form of Borrowstounness. This dates back to the early 1400s when the Burgh of Linlithgow built a harbour on a broad promontory (or "ness") projecting into the south side of the River Forth to allow it to export the ever-increasing amounts of coal being mined in the area. 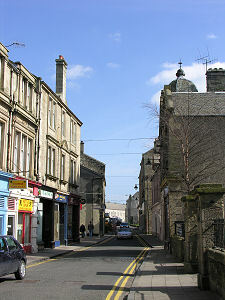 The "burgh's town on the ness" became Borrowstounness, and, eventually, Bo'ness. 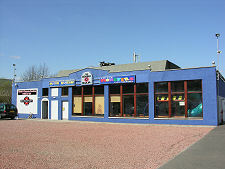 This was not the first time in history that Bo'ness's location had seen it attract a major construction project. In AD142 the Roman Emperor, Antoninus Pius, decreed that the northern limits of his empire should be secured by a barrier linking the River Forth with the River Clyde. The result was the 37 mile long Antonine Wall. This was only in use for 20 years before the Romans retreated to the much better known Hadrian's Wall, but many traces of the Antonine Wall still remain today, and its eastern end met the shore of the River Forth just to the east of Bo'ness. Today the line of the wall is indistinct in Bo'ness itself, but the partly excavated remains of a Roman fort can be seen in the Kinneil Estate, immediately to the south west of Bo'ness; while the site of another fort is known at Carriden, near the shore to the east of Bo'ness. But let's return to the establishment of Bo'ness as a harbour from which coal could be exported, because this was to set a theme that was central to the development of the town for the next five hundred years. 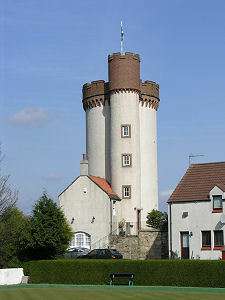 In 1668, Bo'ness received its own charter as a burgh, under the auspices of the Duke of Hamilton, one of whose residences was at nearby Kinneil House. By this time it was the main port serving Stirling as well as Linlithgow, and a huge amount of coal was being mined in the wider area, much of it being shipped to Holland. 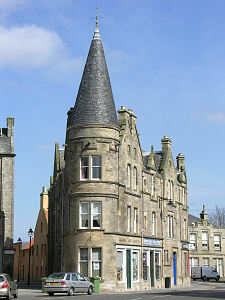 As a result, Bo'ness had become Scotland's second largest port after Leith. 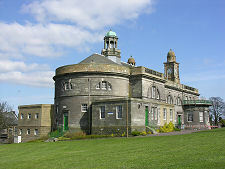 It had also become an important centre for the production of salt from sea-water evaporated over coal fires. 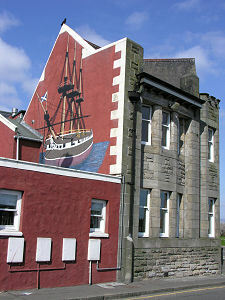 In the 1720s, Daniel Defoe reported that Bo'ness had more ships than Edinburgh and Leith combined, but also noted that trade had declined in recent years. He attributed this to the diversion of trade from Scotland to England following the Act of Union of 1707: but it may also have been due to the increasing difficulty in extracting coal in the area using techniques then available. But things were to improve rapidly. Bo'ness harbour saw a series of improvements through the 1700s. Meanwhile trade boomed. 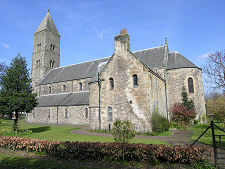 This was partly as a result of improved mining techniques that allowed coal to be extracted from rich, deeper seams; and partly as a result of the discovery of iron ore in the area and the establishment of an iron industry in Bo'ness. Over the same period, salt extraction continue to be important to the town, and from 1766 the Bo'ness Pottery began production. A visitor in 1769 commented that Bo'ness was "smoking from its numerous salt-pans and fire-engines - a town enveloped in smoke". That was the same year in which Bo'ness was to play a small but significant role in the industrial revolution. 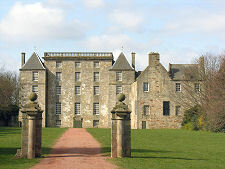 At the time the grand Kinneil House was leased to Dr John Roebuck, the founder of the Carron Ironworks north of Falkirk. He sponsored secret work by James Watt to develop an improved steam engine that could be used to pump water from deep coal mines. Watt only perfected the improved engine a few years later in partnership with Matthew Boulton, but the tiny cottage in which he worked for Roebuck at Kinneil still stands immediately behind Kinneil House itself. 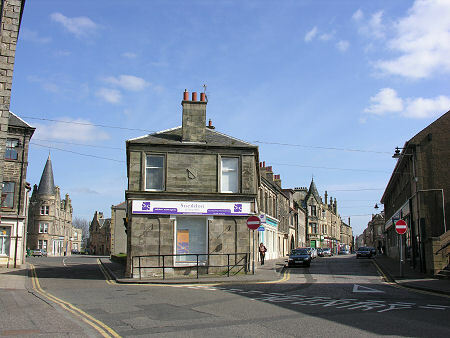 Bo'ness diversified into distilling in 1795, and a branch line railway arrived in 1840. The harbour, mines, iron works and distillery all saw major expansions in the latter half of the 1800s. In 1901 the town's prosperity was riding sufficiently high for building to start on the magnificent town hall, on the hillside to the south of the centre of the town, where most of the Victorian residential development had taken place. In 1911 the local architect Matthew Steele built the remarkable circular Hippodrome cinema as a focal point for the town centre. 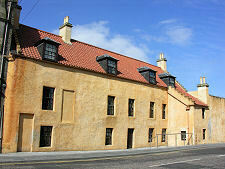 After a period of dereliction this has been restored to full use as a cinema. Any story of a booming economy based on heavy industry is going to have a "but" in it, and Bo'ness's story is no exception. The middle half of the 1900s was a period of steep decline for the town. 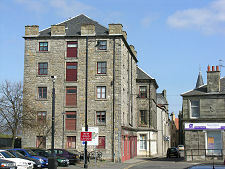 The distillery ceased operation in 1925. 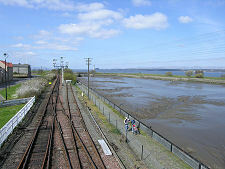 The harbour was closed in the 1950s, unable to compete with the better facilities at nearby Grangemouth. The branch railway closed. The local shipbuilding industry first turned to shipbreaking to make a living, then closed altogether. The coal industry still flourished, however, and Kinneil Colliery saw major investment through the 1950s and 1960s that allowed it to access coal seams far out under the River Forth and, eventually, bring to the surface coal mined at Valleyfield Colliery on the Fife shore of the River Forth. But the wider decline in the coal industry eventually prevailed, and the colliery closed in 1983. 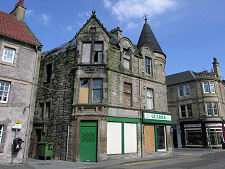 By then, however, the first signs of a rebirth for Bo'ness were already present, though probably not very obvious at the time. 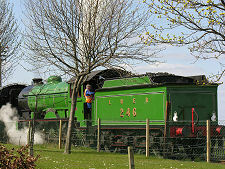 In 1979 the Scottish Railway Preservation Society set up its base here, establishing a major railway centre on a greenfield site close to the River Forth, and re-laying part of the track of the old branch line. Today's visitor to Bo'ness is likely to be surprised by the town. Yes, the view across the river includes the Longannet Power Station as well as Culross and the Ochils. And yes, the view west along the river is dominated by the petrochemical works at Grangemouth. But if you look more closely, you begin to get a strong sense of a town that is turning a corner. Some fine new residential developments have already taken place, and more are planned. The restoration of the Hippodrome has transformed the town centre. Even little touches like the mural on the rear of the old Bo'ness Iron Company building (now overlooking a new supermarket) suggest a positive change in direction.